China Mobile Pakistani arm, Zong, is anticipated to take nearly 12 months or more to kick off its 4G services in Pakistan. Zong is the first and only operator in the country to achieve a 4G license in the recent next generation licenses auctions. CEO Zong Dr. Fan Yunjun presided over a conference regarding the time frame of 3G/4G services in Pakistan. He also mentioned that Zong has been in talks with a vendor for installing 4G equipment on its stations but the fact is that is going to consume a couple of months to get things underway for this purpose. Zong Chairman also highlighted that the mastermind behind Zong, China Mobile, is undoubtedly the biggest 4G network on the planet with almost 252,000 4G sites all over China. It also aims to make it twice of the present number of 4G sites by 2014. 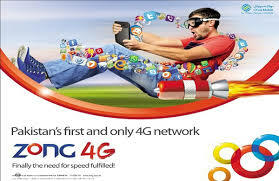 Zong also claimed to finish the 4G system deployment well ahead of the scheduled time frame. But it will be a long way to reach the final point as the company has to start it right from the word go. Apart from this, Zong is fully prepared to initiate 3G facility after winning a 10 MHz band license and NOC from the regulator. Zong claims that their system will be ready by the start of next month. Sources from within the company also give clues about the launch of 4G services that it will be started a bit earlier than the scheduled time at different selected places all over the country. Analysts forecast that a super-fast real-time speed of 10-15Mbps will be provided by Zong on its 4G platform. Zong has also been reported to pay its entire remaining license dues on a one time go due to heavy interest factor involved in the licensing fee for next generation spectrum.